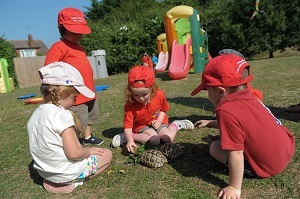 The Hullbridge Pre-school is situated in Hullbridge, Essex and accepts children aged 2 – 5 years. We have a beautiful, light and spacious classroom with wonderful indoor facilities including IT, book corner and snack area with purpose built toilets and washbasins. We have access to fantastic large enclosed all weather green play area. It is a tranquil, idyllic setting which can be experienced all year round where children can play, grow and learn. Children and staff all enjoy learning and teaching in such a calm environment. We have a low staff turnover which contributes to the stability of the pre-school and allows it to benefit from the continual development and learning of its staff. Two of our staff members have been with the pre-school for over twenty years. We are a non-profit making organisation, run by a parent committee. We are registered as an educational charity with the Charity Commission (registration number: 1151931). We are also members of the PSLA and Ofsted registered to provide education and care throughout the Foundation Stage.